Remember that she’s been out on the Left coast touting how activist she plans to be on behalf of the Leftist agenda. Of course they opened their wallets for her. State Supreme Court candidate Rebecca Dallet raised $416,646 in the lead-up to the spring general election, according to a fundraising cover sheet her campaign shared with WisPolitics.com. 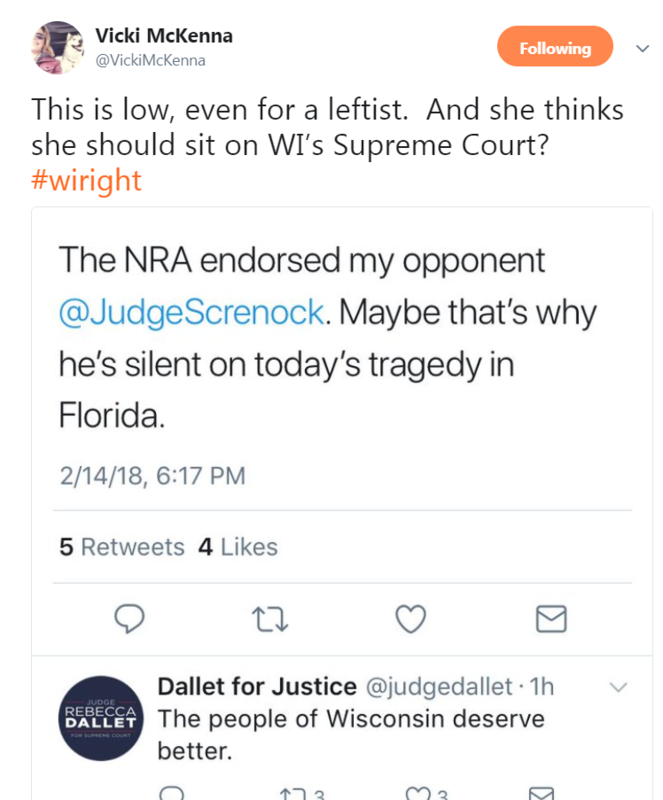 Is she running for Supreme Court Justice or Wisconsin Democratic Party Chair? Hard to tell. MADISON – Wisconsin Supreme Court candidate Rebecca Dallet told donors in California this week that San Francisco values are Wisconsin values and spoke of the need to defeat Republicans in 2018, according to leaked audio of the event. “San Francisco, like, this is awesome, the people,” Dallet told the crowd, according to audio circulated by the Wisconsin Republican Party. Dallet, a Milwaukee County judge, is running against Sauk County Circuit Judge Michael Screnock in the April 3 election. The winner will replace Justice Michael Gableman, who is part of the high court’s conservative 5-2 majority. Dallet also talked about the opportunity to defeat Wisconsin’s top two Republicans, Gov. Scott Walker and Republican House Speaker Paul Ryan of Janesville. “Our governor is potentially someone we can unseat,” Dallet said. Milwaukee County Judge Rebecca Dallet has presided over at least one case involving attorneys from her husband’s law firm despite a self-imposed rule not to do so that she has touted during her campaign for Supreme Court. Dallet this week also recused herself from three recent cases on her docket involving attorneys from the Husch Blackwell law firm after being asked about them by the Wisconsin State Journal. In the last seven years, Dallet has been assigned to six cases involving attorneys from the firm that were resolved with little or no action, or were transferred to Dallet after a decision in the case had been entered by another judge. Wisconsin’s Code of Judicial Conduct does not preclude Dallet from presiding over cases involving her husband’s law firm, but Dallet has repeatedly said on the campaign trail she made a point not to do so to ensure the public’s trust in the court. Sauk County Circuit Judge Michael Screnock and Milwaukee County Circuit Judge Rebecca Dallet advanced out of Tuesday’s primary for the Wisconsin Supreme Court. In Milwaukee County, Dallet won over Screnock while Burns trailed badly. Dallet also overwhelmed Burns in his home of Dane County. Statewide, Dallet had 36% to Burns’ 18%. Good job, Wisconsin. And this election hints that the forecasted Blue Wave may be overstated. What a horrible attempt to use the dead kids in Florida to attack her opponent. The race for the Wisconsin Supreme Court is shaping up to be quite… energetic. The forum, moderated by University of Wisconsin-Madison Political Science professor Ryan Owens, in large part proved to be a bare- knuckle political brawl between the two left-leaning candidates, Madison attorney Tim Burns and Milwaukee County Circuit Judge Rebecca Dallet. The other candidate, Sauk County Circuit Judge Michael Screnock, the conservative in the race, mostly remained above the fray, periodically asserting that his opponents are effectively Activist Judge 1 and Activist Judge 2. The three candidates face off in a primary election scheduled for Feb. 20, with the two top vote-getters on the ballot for the April 3 general election. I think Screnock lays out the lines in the race quite well. We have one candidate with a conservative judicial philosophy (Screnock). We have one candidate with a liberal judicial philosophy who maintains some decorum (Dallet). And we have one candidate with a liberal judicial philosophy who sounds like he wants to be the governor, legislature, and judiciary all in one (Burns). The fault lines are pretty clear.